Jive is a reliable VoIP provider for small to large businesses. It has a wide selection of features although they are lacking some collaboration features that can be found in other systems. However, the pricing tiers mean that every plan has the same host of features to ensure every business has access to the same package. Jive was established in 2006 to provide VoIP solutions to businesses of all sizes. Aimed at businesses that operate primarily within the United States, it offers unlimited domestics calls and support in the US. Each of its plans offers the same wide selection of features, with the only differentiator being in the number of users it supports. Helping you take your business on the go with the mobility app, Jive aims to improve communication, collaboration, and engagement through its system. There are a number of different plans available for your business, to ensure your business needs are met and that the plan is suitable for your budget. You can get a customized quote based on the number of users if you contact the support team. There is one version of the software so that all tiers have the same features available. The difference lies in the number of users that can be connected with each price range. Jive makes it as easy as possible to set up. Because the Jive PBX is completely hosted, no setup or configuration is needed. All that’s required is phone provisioning, which the Jive team will sort out before your phones arrive. This is particularly simple if you purchase a phone from Jive, although even if you use your own device, they can sort this out for you. You’ll need to configure your dial plan according to your business needs and implement configurations, but the customer support team will work with you to ensure it runs smoothly. The first step is plugging in your phones. Plug in the cables for the handset and headset. Plug the network cable from your internet source into the phone’s LAN port. Plug a network cable into the phone’s PC port and plug the other end into the computer. In a case where the phone is not using PoE, you must plug in the power adapter. Contact support to set up all the features you need. There is a web support center which includes an FAQ section where you can find the answers to many common questions. If you prefer, you can complete an online ticket and someone will get back to you. If you want immediate answers, you’ll do best to call their toll-free phone number as they are available 24/7. 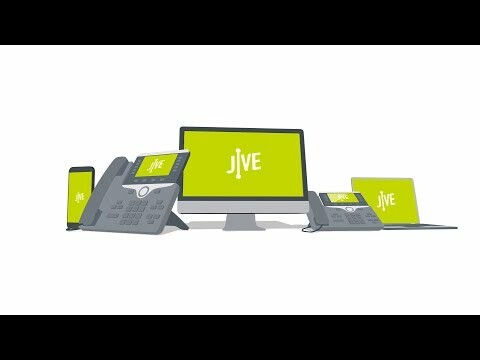 Jive is a reliable VoIP provider that offers a wide range of features to suit all sizes of businesses. It focuses on improving communication, collaboration and engagement through the core capabilities and advanced features that are available for all users. Differentiated by the number of users only, the plans appear simple at first glance. However, there is some ambiguity in terms of the unlimited domestic calls and you might find yourself charged for going over a certain number of calls. This can add to the cost of the service. While there are some features that are not available which we would have liked to have seen, it does have enough features to make it one of the popular VoIP systems for small to large businesses.